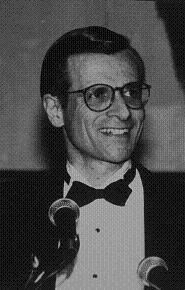 A practicing lawyer earlier, he led Chicago’s NAMES Project chapter and from 1989 to 1991 was IMPACT’s first full time executive Director. He then joined the staff of openly gay U.S. Rep. Gary Studds; returned to Chicago in 1992 as development director for the Chicago Department of Health AIDS programs; and resigned for health reasons in 1993. Born in 1952, he died in 1994. Robert J. Adams is a native of Macomb, Illinois. He earned his degree of Bachelor of Arts in political science, speech communication, and history from the University of Illinois at Urbana, and his Juris Doctor degree from the University of Illinois College of Law. After moving to Chicago in 1978, Adams spent nine years as an associate attorney and officer of a prestigious law firm. The anti-gay discrimination that he recalls experiencing there led Adams to commit his talents and energies deeply to the struggle for lesbian and gay civil rights. Adams left private practice for public service, spending the next two years as a Chief Assistant Corporation Counsel in the City of Chicago’s Department of Law. During 1987, he became involved with the Chicago organizing committee for the 1987 Lesbian/Gay March on Washington. From October 1987 through July 1988, Adams served as the chairperson of the Chicago Chapter of the NAMES Project — the AIDS Memorial Quilt; his leadership was instrumental in the successful efforts to bring the Quilt here for its moving display at Navy Pier. From 1987 through 1989, he also served on the board of directors of Howard Brown Memorial Clinic, chairing its Development Committee. During 1988, Adams became a founding member of and the Chicago spokesperson for the Human Rights Campaign Fund’s Federal Club. In 1989, Adams left the City’s Law Department to become the first full-time executive director of IMPACT, Chicago’s gay and lesbian political action committee. He served in this position through 1991, and his contributions were critical in the development of IMPACT into a sophisticated and professional political action committee. Adams then moved to Washington, D.C., where he joined the staff of openly gay U.S. Rep. Gerry Studds (D-Mass.). Adams served as a national point-person for a variety of lesbian/gay issues, and he accompanied Studds on travels to meet with community representatives all across the country, including Chicago. He returned to Chicago at the end of 1992, accepting the newly created position of development director for the Chicago Department of Health’s Division of HIV/AIDS Public Policy and Programs. Citing medical reasons, he resigned this post in August 1993. Throughout his history of activism, Adams has exhibited a combination of political savvy, superior organizing skills, professionalism, and sensitivity. He was awarded the 1988 Gay Chicago Magazine “Organizer of the Year” Award for his work with the NAMES Project. In 1994, he was awarded IMPACT’s Alongi Award in recognition of his continuing contributions to Chicago’s gay and lesbian community.